Alcohol Inks Tutorial with a VIDEO! I made a video (Yes, Virginia made a video!) and photo tutorial for you today! So....recently I re-discovered a few "tricks" with alcohol inks while I was playing with collage stamps. 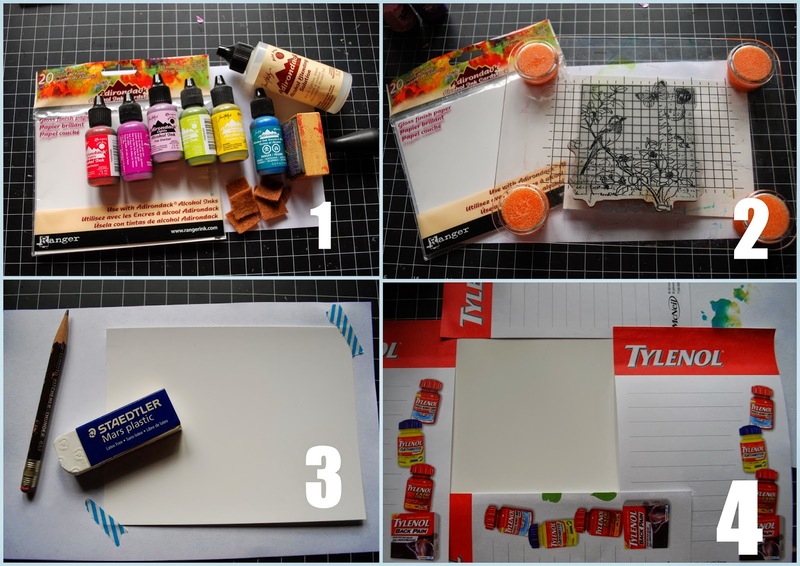 Here is the photo tutorial with a different stamp (Garden Letter) that helps you to understand/see my creative process. 5. Ink up the blue alcohol inks (with Blending Solution) first. 6. Apply the bright pink/purple colors around the flowers and butterfly area. 7. With a previously made mask (with the bird and butterfly cut out), I inked up the bird in yellow. 8. After removing the masked borders, this was what it looked like after inking. 9. 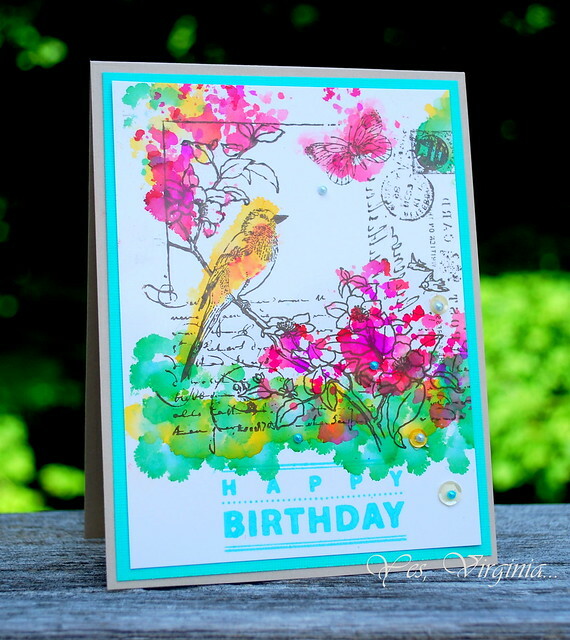 Stamp the image (Garden Love by Penny Black) in Cup O' Joe ( Hero Arts), then magic happens! This was the final result--Ta da! An artsy farsty collage card! I am now on the hunt for this Alcohol Fillable pen marker (see here). I know I would have fun playing with it. 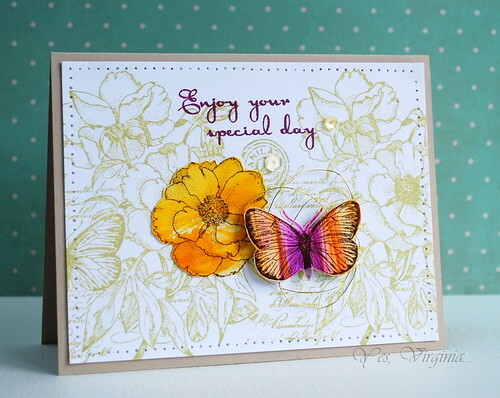 I popped up the stamped butterfly for extra dimension and interest. I think the original inking turned out a bit too messy. I think this technique works well with collage stamps as the coloring doesn't have to be precise. 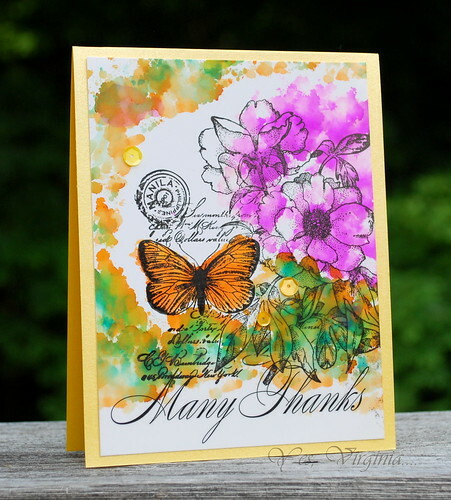 The reason I stamped the image AFTER applying the alcohol inks is because the stamped image would be smeared/distorted when alcohol inks are applied (due to the Alcohol Ink Blending Solution). Practice is the key! Spend time playing with alcohol inks really helps. I hope that you find this tutorial helpful. Thanks so much for stopping by! 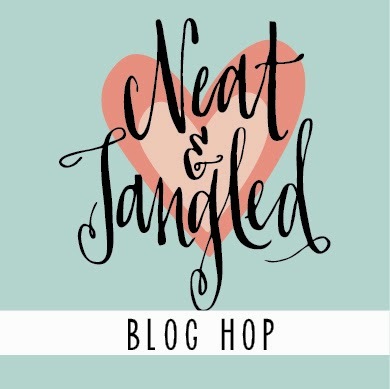 I am so happy to be part of a fun blog hop for Neat and Tangled! I am sharing two projects with this stamp set called "Photo Booth". You probably came from the talented Laurie's blog. If not, come join the hop! Prizes: 2 winners will be chosen from comments all along the hop! The winners will have their choice of Photo Booth or Sunday School Songs. Winners will be announced on Saturday July 5th on the Neat and Tangled Blog. As you may be aware, photo booth is in trend these days! I had seen them in use on special occasions. In fact, my niece and nephew both had photo booths at their wedding receptions. It is really fun and great for all ages. I created the first card using my son David's actual photos from the photo booth. He is turning 20 in August and I think it is perfect for him to see how far he has come! My 2nd card is fun one. I did some masking with the photo booth image, stamped and embossed the rest of the card. I love the sequin stamp... I also love the various sentiments in this set. It's a versatile set for any age! I hope you enjoy seeing how this stamp set being in use. Please join me and hop along. Your next stop is my dear sweet blog friend Savannah's blog. I know she has something amazing to share with you! Thanks for stopping by! I have been playing with alcohol inks and collage stamps lately. This was one of the cards I made. Notice how the yellow bird was colored? I was quite happy when I had the Eureka moment! "Life is like playing with alcohol inks, you never know what you're gonna get." June 29th (Midnight Eastern Time). Hello! 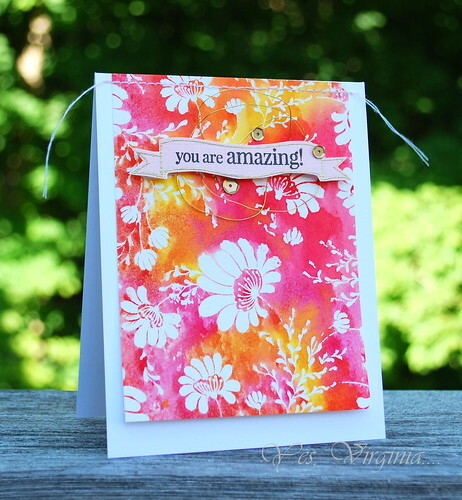 It's my turn to share some projects over CAS-ual Fridays Stamps Blog. 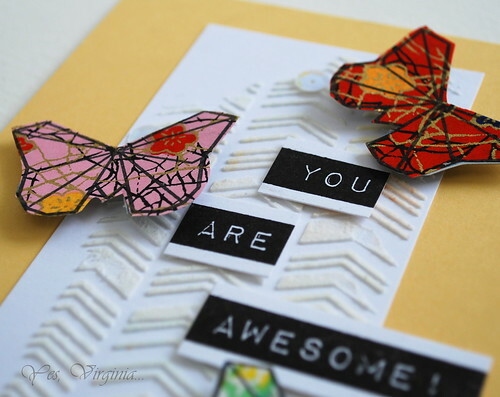 I have one more to share over CAS-ual Friday's Stamps blog. 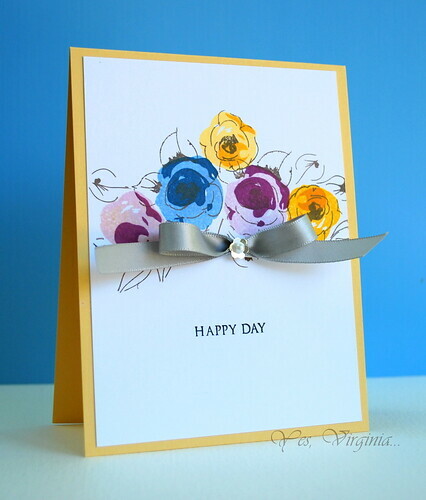 For all the details about my cards, please visit CAS-ual Fridays Stamps Blog. Hello! It is my 4th week over Altenew. What can I say? I had an absolute blast playing with the new stamps! Here I am sharing two of the 6 cards I made for Altenew. Yes, a whopping 6! 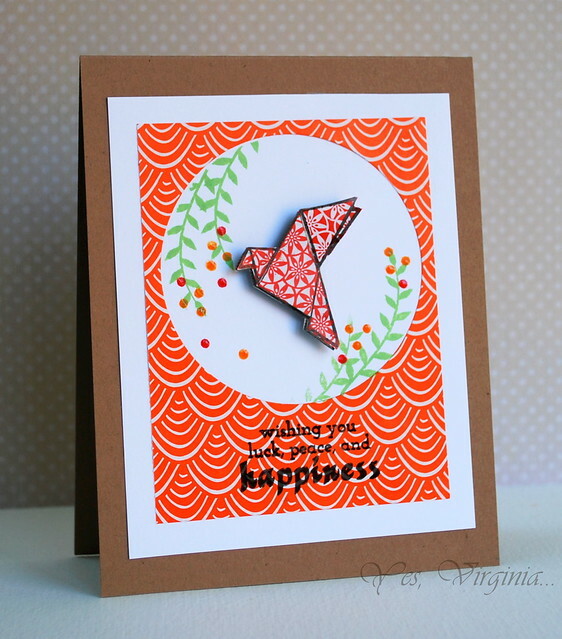 This one calls for mixing the stamps up and paper-piecing. I pieced each part separately because when you actually fold the Origami paper, it should be not the same part of the paper. Make sense? This is definitely one of my favorite cards that I created with Altenew. Please you simply MUST stop by Altenew to check out my other projects. I would appreciate if you can leave me your feedback over Altenew. 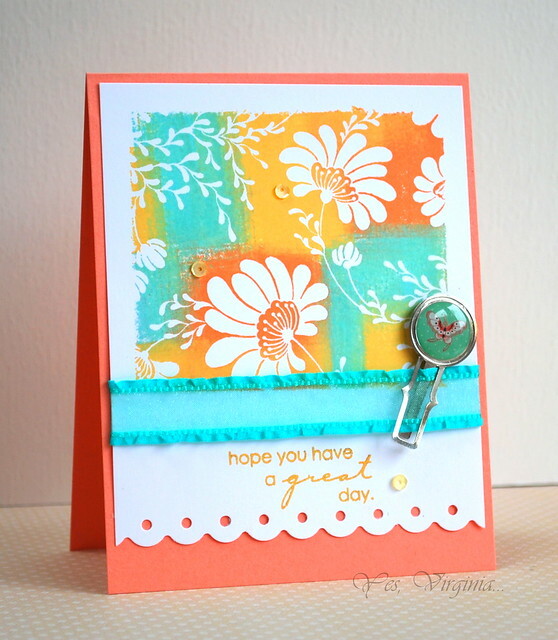 Today's card is a follow-up on my previous post about background stamping (Floral Tapestry). Instead of inking up the entire background, I chose to use only part of the background stamp. Keeping the stamped area small makes it less overwhelming. You can then add more elements or embellishments to your design. When inking up this design, I used the small cubes of inks (see here) to stamp the colors in the chosen area (masked off with washi tape). Then I added the ornate clip (Fancy Pants), sequins and ribbons (Pretty Pink Posh). 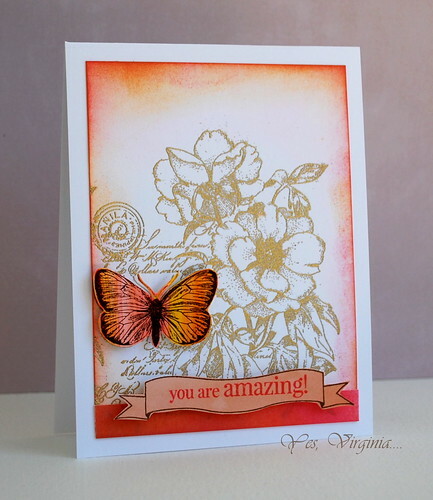 Stamped the sentiment ( Amazing from Penny Black)...done! I will be back tomorrow for my last week of guest design at Altenew. In the last few months, there seems to be a lot more clear stamps and die cuts coming on the market. This is my personal observation, I could be wrong... It seems these newer stamps predominantly focus more on fonts (cursive, handwriting, mixed styles), shapes (hearts, circles, stars, triangles) and everyday objects (I phone, camera, envelops). We all love varieties, no doubt. 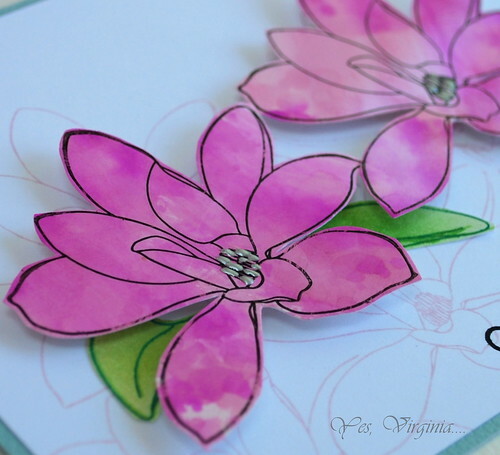 But I must say that I miss playing with the old-fashion floral background and collage stamps. Lucky for me to get a hold of a few floral stamps from Penny Black. I inked up the Distress Inks (Mustard Seed, Pickled Raspberry, Ripe Persimmon, Spiced Marmalade and Festive Berries) onto the stamp. Then I spritzed 4-5 sprays of water (about 10 cm away). I then placed my watercolor paper over and let the water/ink soak though. Lift carefully...and voila! One of my harshest critics is my daughter Stephanie. She often cautions me not to make the "old lady style" cards. What are old lady style cards, you'd ask? 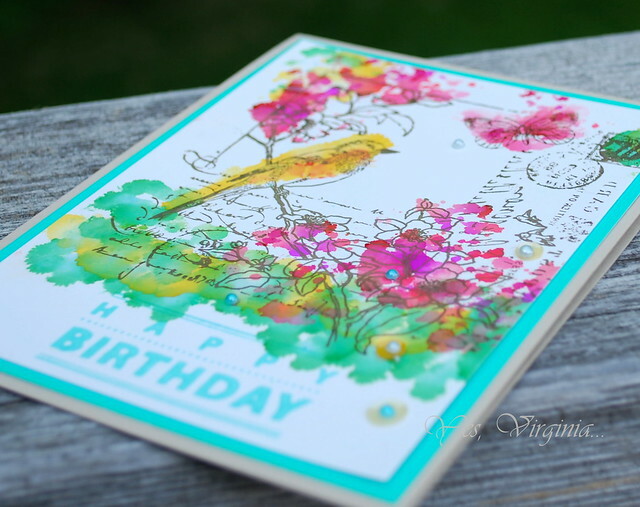 To her, the old lady style cards are always heavy on colors, the design is rigid and often has way too many layers! Sounds harsh, huh? But I think she has a point! So when I worked on this Floral Tapestry stamp, I kept that in mind and tried my best to design with a chic and modern vibe! I am not sure if I succeeded on this, but it sure made me think of better designs in general. 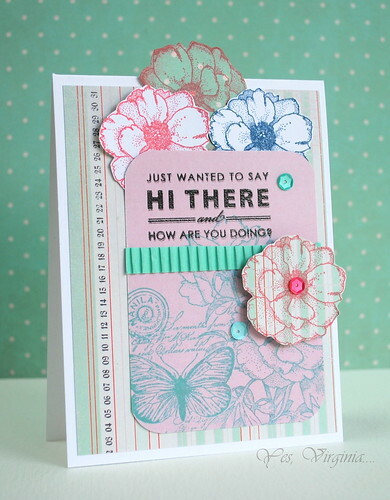 I hope that you are inspired to play with your floral background stamps more. They have so much to offer. When I come up with another version with this stamp, I will share. NEW (to me ) Penny Black Stamp! I am sharing another new (to me ) Penny Black Stamp with you today. 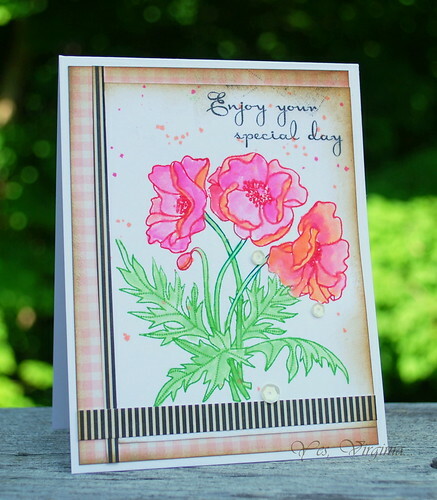 When I started out stamping many years ago, if I saw a stamp like "Poppy Trio" I would have been so intimidated and not sure what I would do...It's quite obvious that it "begs" to be colored. But I am not great at coloring (still not), but I think now I can at least comfortably make something decent out of it. The convenience of Distress Inks and water (applied with Water Brush) could not get any better...This easy technique makes any novice look like a pro! I think I "faked" it well!? One little "accident" happened right after I finished the coloring! 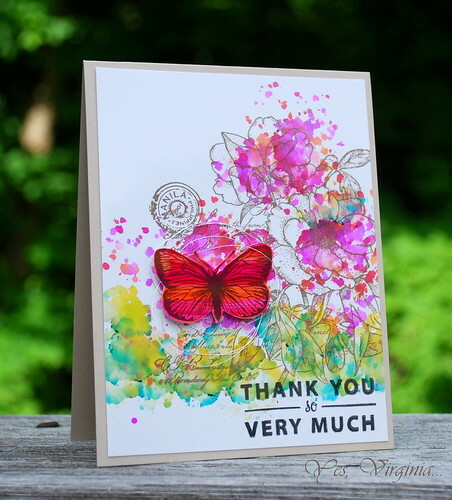 As I was just about to adhere the card to the card stock after stamping the sentiment, the acrylic block fell off my hand and got right on the top right corner! You can still see the shape of the acrylic block if you look closely...What the *#%& ....I was SO mad....all that hard work and "decent" coloring was wasted! Well, I guess a little distressed edges will not hurt. So I applied Frayed Burlap Distress Inks all over the edges. Phew! I think you can barely tell that I had a "accident",right (wink)?! I hope that you will re-examine a stamp like this one and take out your distress Inks and perhaps enjoy the simple coloring! PS: Thanks to Darnell's invite, I am linking this up to NBUS. This sweet blog friend Darnell is hosting a Never Before Used Schtuff Challenge (Anything Goes, Friendship theme). What fun! If you have never checked out Darnell's blog, I recommend you to do so, as she is a ton of fun to hang out with. It has come time to say "enough is enough"....I am talking about Botanical Notes. I am sharing two more cards with this stamp from Penny Black. I think I have pretty much exhausted my own ideas and did the best I can to use this stamp in so many creative ways ( about 17 cards). This stamp has so many intricate details. It works so beautifully as a background stamp. And that is exactly what I did here. I happened to have the alcohol-inked butterfly and flower. It was easy to complete the design. It was also tempting to stamp the sentiment in black. BUT I decided that it might look good in purple (echoing the butterfly color). Next is another similar theme, except I paired it up with pattern paper. I think it works! 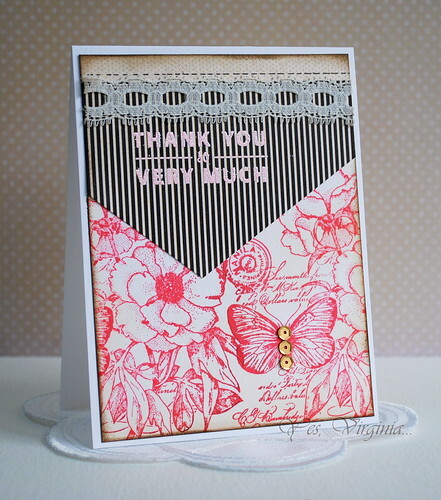 I pink-embossed the sentiment and added some lace and sequins, voila! I truly hope that this little series of mine inspire you to look at a collage stamp in a different way. A stamp like this really is a gem. Would you like to see more of this type of card? Perhaps some photos of my process will help? Today's my 3rd week at Altenew. I am excited to share my projects with you. I hope you like what I created! It's all about "Pattern Paper". Here is one of the MANY projects I share. Please head over Altenew to see all of my work there! I would totally appreciate it if you can leave me your feedback/comment here. 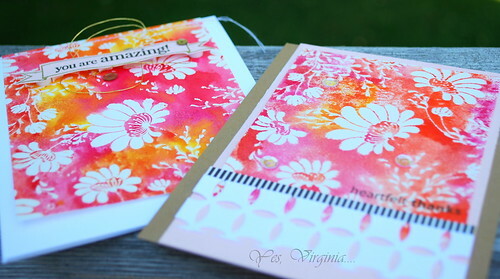 I have been intrigued by this new challenge over Moxie Fab World called Journaling Cards. It is challenging us to make something with a journaling card for a pocket page scrapbook. 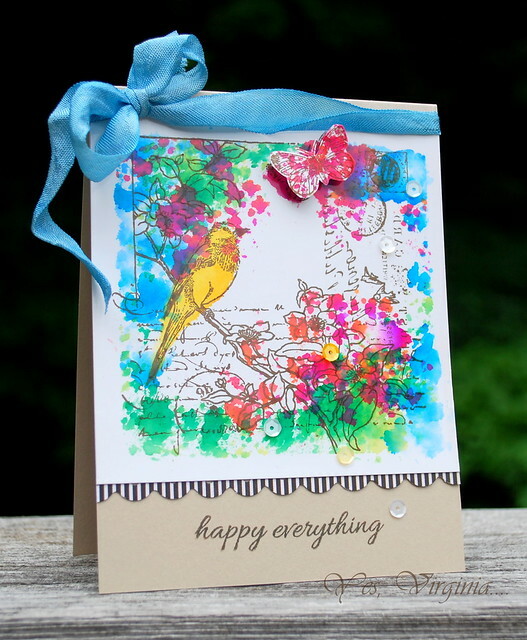 You can make either a greeting card, a scrapbook page, a pocket page or an altered project. I set out to make something with the one and only stamp that I have been obsessing with, you've guessed it--Botanical Notes. You almost can't tell it's from the same stamp that I have been using over and over, right? I am going to finish posting Botanical Notes with two more renditions and hopefully, that's the end of it. I think my other new stamps are starting to get jealous since I have been playing with nothing but Botanical Notes! Edited: I just found that that I was spotted by Penny Black (see here) this morning. What a pleasant surprise to wake up to....I knew it was love at first sight when I laid my eyes on this Botanical Notes! I am popping in for a special post (I know, so much for a mini blog break!!). I almost forgot to post this, but this is your chance to see me live in an interview...so you might want to check it out!? When Chaitali approached me back in March for the Iron Craft interview, I was not sure if I should do it! ~I have a very strong accent. Chinese is my mother language, can you tell? LOL. I didn't think my accent was THAT bad, but this interview made me cringe a little because I should have watched out for my accent and kept it in check....but then again, Dr. John said that if I "disguised" it, then it's not the genuine me. I think he has a a point!? ~I don't always look at the camera correctly. I didn't realize that the morning lighting from my window was a bit bright for my eyes. So I kept looking away from the camera. Here is my collaboration with Chaitali. To go with the Virginia's View challenge, we both made tags/scraplings with the recycle item. 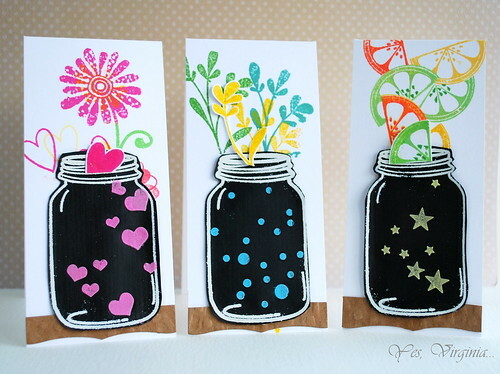 We used the same stamp set Love Jar from Hero Arts. Chaitali did a superb job using these stamps! And guess what? Hero Arts is the sponsor for this challenge and they are giving away the same stamp set Love Jar! I want to sincerely thank Chaitali for taking the time and effort to do this interview with me. She was so fun to talk to. What a sweetie! While you are there, please leave Chaitali some blog love and comment (for a chance to win Hero Arts Love Jar stamps) and perhaps give her a thumbs up for the video interview (even though I sucked)! Last week I started to play with alcohol inks again and...they made me really happy. The vibrancy of alcohol inks is simply amazing. Here are the examples that I came up with. Be warned: you might need sunglasses since they are so very bright! uh...I made them with Botanical Notes (again). The butterfly was a discarded piece from my other projects, but it totally fits in this card. I used a piece of felt to apply alcohol inks and the Blending Solution. While I was at it, I made another one. This time, I took the stamps' butterfly and strategically inked the butterfly only. I adore this butterfly because it is very detailed and easy to fussy cut (except for the antennas)! I purposely kept the butterflies flat as if they are specimens. I took these two photos on my deck facing the backyard trees...I love the greens in the background! I will try to do this more often while the weather here is still amazing! Both cards' sentiments are from So Kind (Penny Black). edited: I used Glossy card stock by Rangers (see here). I realized that I have been blogging so much that I should/need to take a mini blog break! It's likely a good idea, that way you won't be tired of visiting my blog! I will be back next week. Hopefully I have something other than Botanical Notes projects to share! Virginia: Ouch...I had this paper cut from two days ago and it's still hurting. Dr. John: What paper cut? Virginia: It's from handling that heavy card stock from Michael's. It's still red and puffy. What should I do? 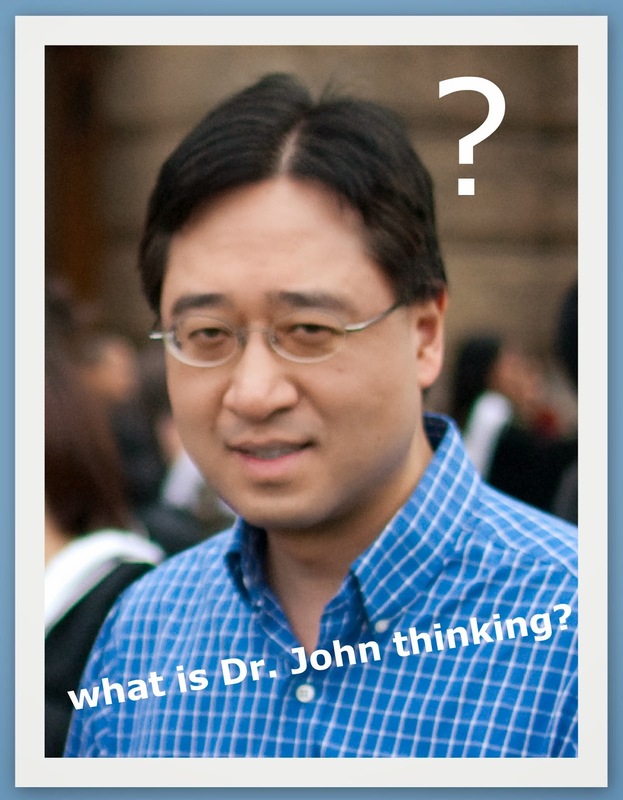 Dr. John: Stop making cards. I was watching the French Open a few days ago and I loved Maria Sharapova's and Canada's Eugenie Bouchard's tennis outfits in the semi-final match. Sharapova beat Eugenie and ended up winning the French Open. It was a great game to watch. I hope Eugenie will go on to become the next BIG tennis star! What can I say? Even when I watch tennis, I can't help thinking about making cards! 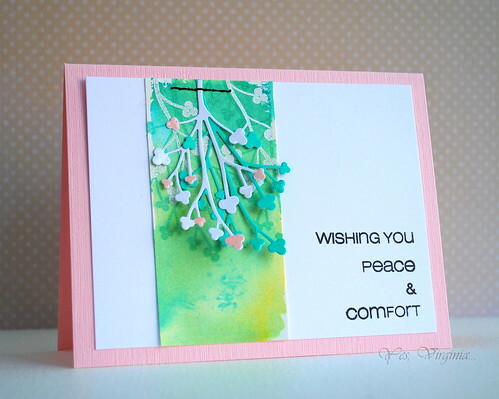 The colors that you see on this card were all inked with distress ink and Pale Tomato (Hero Arts). I love this combo. 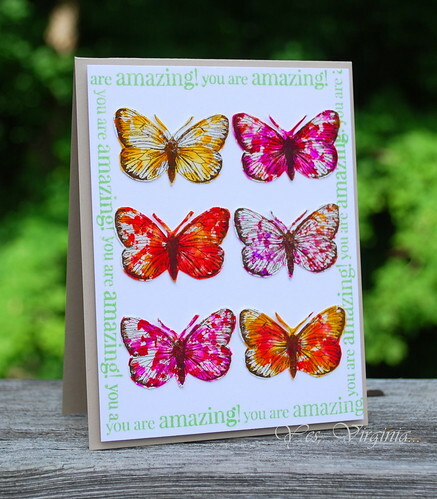 The butterfly was stamped over an alcohol inked paper. I love how this turned out. Thanks for stopping by! Hello! It's my day over Altenew Blog! 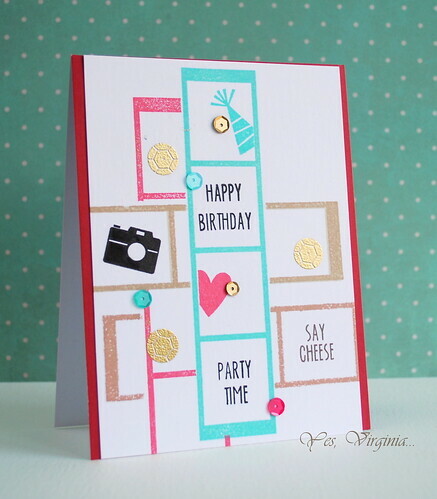 It has been so fun to share new stamping ideas over Altenew. This week, I chose to highlight the theme on inking. I called it "Ink Them Up"! 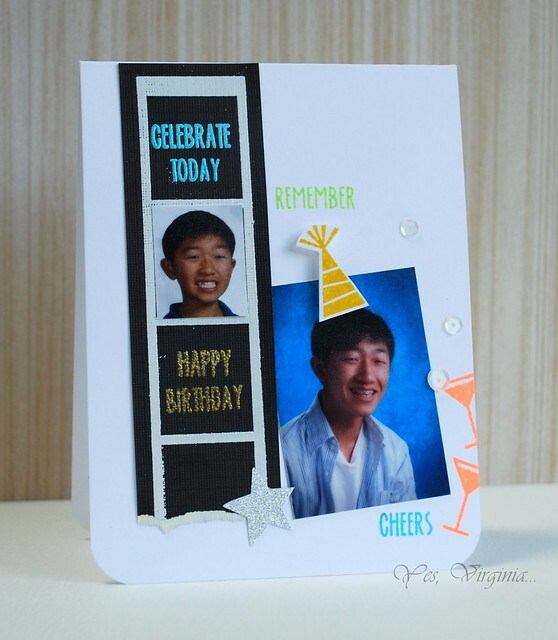 Here is one of the many projects that I made for today's guest design post. If you guessed that it's alcohol inks that I used, then you are absolutely correct. Also, I made this card with Gelatos and I really like how it turned out! 3. After coloring the image, let dry. Then press the entire circle diecut to the embossing pad and clear-emboss the ENTIRE image (not shown in photo). This embossing process not only helps to seal the image, it makes the image look even more shiny and defined. 4. 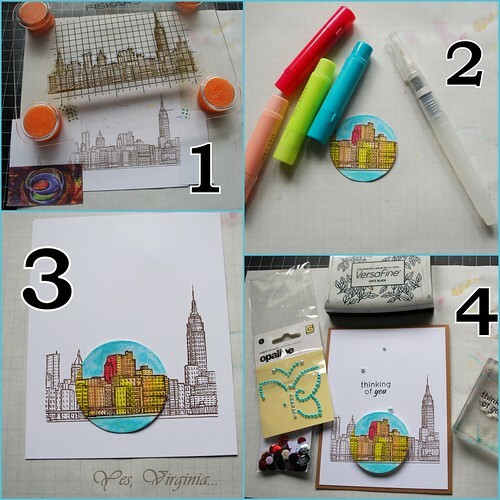 Assemble the card and add dimensions with pop dots. 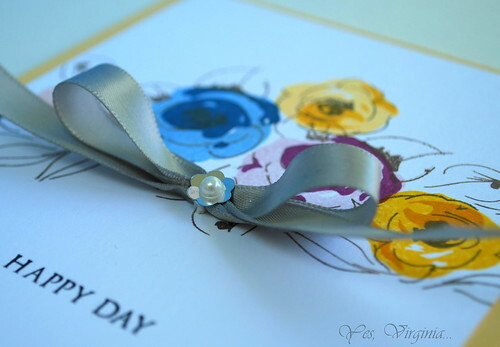 Stamp sentiment and add small pearls. For more projects, please visit Altenew. I truly appreciate your comments and feedback. 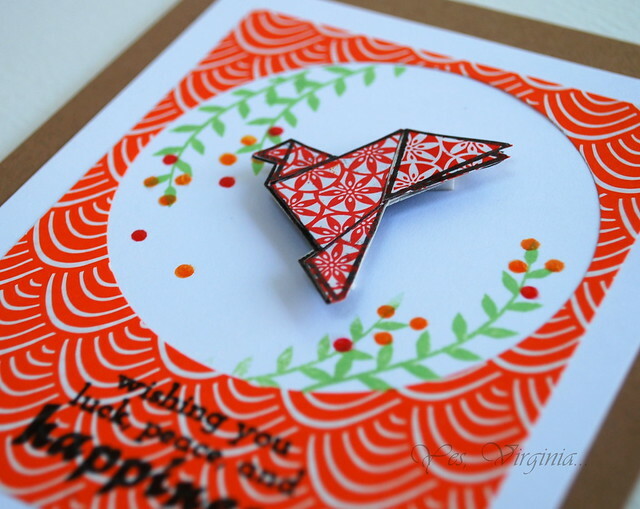 And don't forget to check out Virginia's View Challenge as we have a special guest design joining the fun and she has a VIDEO (go here)! Here is a hint about this guest designer.